Spinlister announces an official sponsorship of the USC Triathlon Team for 2014. Members believe “Spinlister will make racing while jet setting so much more feasible." Spinlister, the world leader in peer-to-peer bicycle, ski, and snowboard rentals is delighted to announce that they have become official sponsors of the University of Southern California’s Triathlon Team. The USC Triathlon Team was founded in 2002 with four members and, since then, has grown monumentally into a team with seventy active members. The team plans on competing in various races, including the March Triathlon Series and Collegiate Nationals in Tempe, Arizona, and Spinlister is thrilled to be part of the exciting season ahead. Spinlister’s CMO, Andrew Batey, is happy that Spinlister will make things easier for the team. “I know how hard the USC Triathlon Team trains to keep lean and fit and I’m glad Spinlister can keep their expenses lean as well, especially given how important money is to struggling college students,” says Batey. One of the team’s biggest goals this season is to introduce others to the sport of triathlon and Dawson believes Spinlister can help. “We have members who have upgraded their bike several times and now have a small collection of road bikes, which can be listed on Spinlister so that USC students can try out cycling,” says Dawson. If you want to learn more about how to rent or list a bike on Spinlister, please visit http://www.spinlister.com. 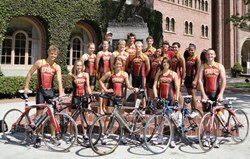 Spinlister wishes the USC Triathlon Team luck in their race at UCSD’s triathlon this Sunday, February 23rd. Launched on April 1st 2012, Spinlister is an online marketplace that allows users to rent and list bicycles, skis, and snowboards in over 100 countries worldwide. With built-in security features and a database of user reviews. Spinlister has won the trust of communities of cyclists, skiers, and snowboarders all over the world.